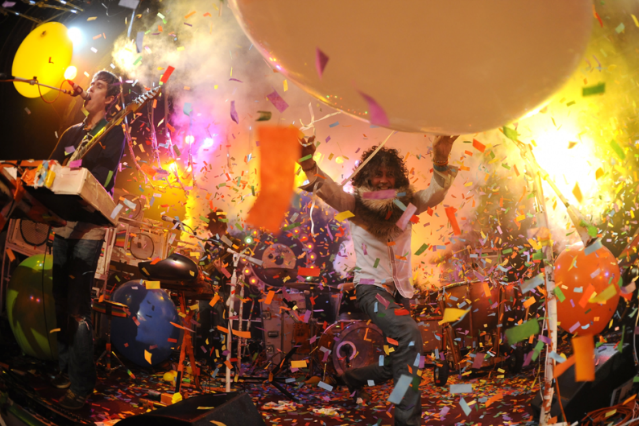 Flaming Lips Officially Have Icky Blood Vinyl For Sale! Wayne Coyne can truly out-creep most of (though not all of) the music world, but his latest venture, dealing in the blood of fellow artists à la Dexter-style specimens embedded in select vinyl copies of the Flaming Lips’ Record Store Day album, The Flaming Lips and Heady Fwends, is perhaps his most genius weird-out of all. Coyne tweeted yesterday that only ten of these blood vinyls are “available” (we don’t even want to know how many aren’t yet), and that they’ll be up for sale starting tomorrow (Friday, May 4) for the low, low price of $2,500. What makes this genius, you ask? Well, in short, Coyne is about to turn a handful of “lucky” fans (he called them “interested rich Flaming Lips people”) into the creepy ones — by making them each one of ten superfans who spent $2,500 on a drop of blood ($2,463.02 if you subtract the $36.98 it costs for the record itself). It’s almost diabolic, no? And to the artists whose blood may be contained in these ten packages (as a refresher, it could be anyone from Yoko Ono to Ke$ha to Bon Iver’s Justin Vernon), might we suggest the Red Cross next time?